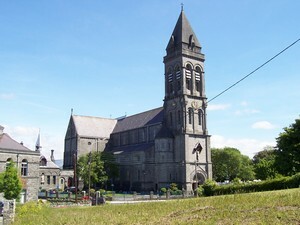 The Cathedral of the Immaculate Conception dominates the Sligo skyline with its tower pointing to the heavens and the chimes from its bells pealing out over the city singing the glory of God. Solemnly opened on the 26th July, 1874 by Cardinal Paul Cullen of Dublin, the Cathedral was consecrated on the 1st July, 1897 and dedicated in honour of the Immaculate Conception of the Blessed Virgin Mary. The Diocese of Elphin again had a Cathedral after a three hundred-year lapse in the wake of the Elizabethan Reformation. The man responsible for the building of the Cathedral was Bishop Laurence Gillooly. Born near Roscommon he studied in Paris before ordination as a Vincentian Priest in 1847. 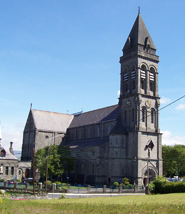 Appointed Bishop of Elphin in 1858, Bishop Gillooly decided that it was time the Diocese again had a Cathedral. Since 1827 St. John’s Parish Chapel, which stood near where the Cheshire Home is today, was recognised as the Pro Cathedral of the Diocese while Bishops had, for the period since the expulsion from Elphin itself, moved from place to place. In 1859 Bishop Gillooly secured a renewable lease from Sir Gilbert King of two adjacent properties close to the Lungy one of which was known as the “Bowling Green”. This was to be the site for the new Cathedral. The architet was George Goldie of London while the main contractor was Joseph Clarence of Ballisodare. Work commenced on the Cathedral in 1869. The exterior of which is built in cut limestone. Modelled on a Normano–Romano–Byzantine style it is the only example of a Romanesque style Cathedral built during the 19th century. Designed in the shape of a basilica, the church has a square, pyramid-capped tower, which reaches a height of 70 metres, and supporting turrets at the west end. The tower incorporates the main entrance to the building. The cruciform Cathedral is sixty-nine metres wide at the nave and aisles, and nineteen metres in height to the apex of the nave roof. It is a very spacious building with side galleries and choir loft. Arches, supported by eighteen massive stone pillars of finely chiselled limestone, connect the nave and aisles. The arch over the main entrance has a series of scriptural figures sculpted in ‘alto rellevo’. The three-faced clock tower, designed by Gillet & Bland of London in 1877, is one of the finest examples of a nineteenth-century turret clock, and the carillon, comprising nine bells, has few comparable to it in Ireland. The largest weighs 1,456 kg, and is dedicated to Our Lady. All the bells are beautifully decorated with the harp and shamrock and the chimes are a familiar sound to all Sligonians. The original high altar was considered one of the finest in the country, surmounted by a brass baldachino and reached by six marble steps. The tabernacle was flanked by two carved panels depicting the sacrifices of Abraham and Melchisidech. 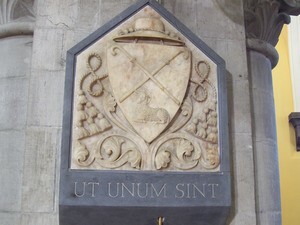 The baldachino and high altar recall, in beaten brass, the artisanship of Asicus, the first Abbot – Bishop of Elphin and Patron of the Diocese, whose wood-carved statue is enshrined in the Cathedral. There are two side altars in the transepts, one dedicated to the Sacred Heart the other to Saint Joseph. designed as a mortuary chapel. 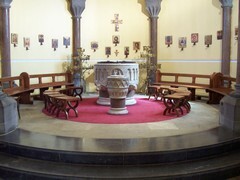 The Cathedral crypt lies immediately beneath the baptistry, where the remains of Bishops Gillooly, Clancy and Coyne were laid to rest and now await the Resurrection. One of the chief attractions to the building is its stained-glass windows supplied by Loblin of Tours in France. 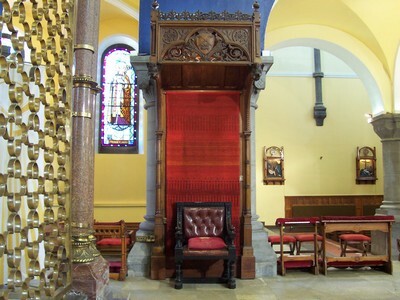 The Bishop’s Chair occupies a prominent place in the sanctuary set against the double pilaster with the corresponding pilaster on the other side of the sanctuary displaying the Diocesan coat of arms executed in marble. 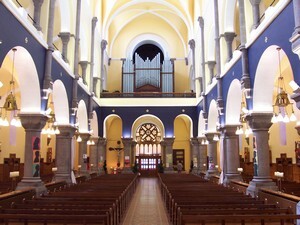 The Cathedral has undergone extensive renovations on two occasions since it was erected. 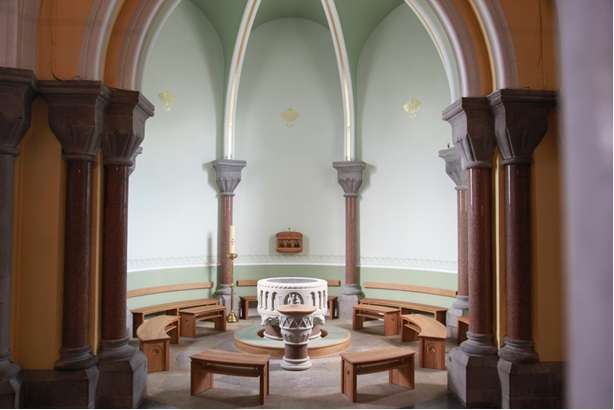 The most recent remodelling of the sanctuary in 1974 – 75, to comply with the revised liturgical norms, was expertly carried out ensuring a very sensitive blend between old and new. 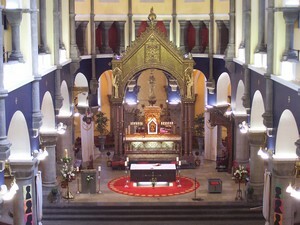 The sanctuary was extended at the level of the high altar. A new altar, which occupies a central position on a raised dais, is of cut limestone and complimented by a matching ambo and presiders chair. The original high altar has been beautifully preserved, along with the brass baldachino. This much admired Cathedral, with its picturesque Ben Bulben backdrop, stands as a memorial to the faith of generations of Catholics in this diocese. This edifice, with its old world of architecture, provides a reflective and prayerful environment for Christian people in every age, and an oasis of hope for those who strive to love and serve God. The vast portion of this article has been taken from “The Diocese of Elphin, People, Places and Pilgrimage” published by Columba Press – ISBN 1-85607-299-1 in 2000. Our sincere thanks to its editor Fr. Francis Beirne, Diocesan Historian and Parish Priest, Ballyforan, Co. Roscommon for his permission in this regard and his kind assistance with this publication. Immaculate Mary please join us in asking Jesus to guide our way. enlighten our searches and journeys. witness God’s great eagerness to love and to bless. Corsica and many dioceses, including Elpin. 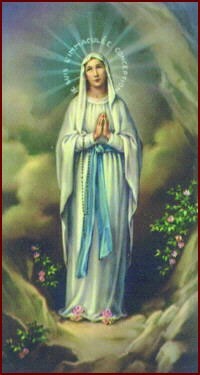 The feast of the Immaculate Conception is December 8. The Dedication of our Cathedral is July 1. God our Saviour in your loving providence you have brought us into being. By your Passion and Death You gave us the possibility to be joyfully united with you for all eternity. We give you praise and thanks for the communion we share as members of the Body of Christ your Son gathered together as your Cathedral parish. We give thanks for each member of the Body particularly in our own parish for friend and stranger for the ones on the fringes and for those near the centre. Fill us, we pray, with the Spirit of your Son. Guide us as you call us to build up the Body of Christ. Help us to see in our lives the moments and opportunities for caring confirming and reconciling. Bless us with the patience to overcome frustration. Bless us with hope as we journey together. Bless all members of the Cathedral Parish. The Church is really something very simple. Basically, it is people – people who are saved by Jesus of Nazareth, who associate with others who have the same experience and interest, and who avail of all the means which help them to follow Him. They desire to spread the Good News about Him. Into these people the Spirit breathes the breath of life. Within a local community these people, with their priest, constitute a parish. Thus the parish is a community of people in a particular locality who find Jesus who is Our Saviour to be a light, guide, power, strength and an inspiration. They associate with one another in an organised way. Love of God and neighbour is their way of living. They avail of all means (especially the Mass, the Sacraments and the Word of God) which help them to come to know Jesus more deeply, and to follow Him more closely. What basically constitutes the parish is not the structures which the people use, but the Spirit-filled people who use them, in Jesus of Nazareth, who gives honour, praise and thanks to God for the salvic graces He bestows on them through the Passion of Jesus.